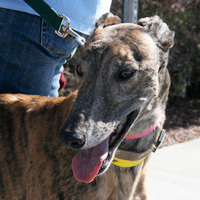 FOSTER UDPATE: Torque is a beautiful boy and a joy to have around, says his foster mom. He’s healthy, friendly with everyone and loves affection. Torque scurries away from sudden unfamiliar noises, but his natural curiosity sends him back to investigate. He is a sensitive dog so a gentle ‘eh eh’ is all that is needed for correction. If Torque is suddenly awakened from sleep, he sometimes barks or snaps at the air. Torque can be left alone for a while without getting anxious. He is well behaved in the home and is not crated, but a baby gate is used as necessary to restrict access. Torque barks at cats who cheekily saunter through his yard, or if someone comes to the door, but it’s not excessive. He is house trained without a doggie door, enjoys car rides and is leash trained. Torque accepts grooming, knows his name, and responds to ‘wait’ ‘come’ and ‘okay.’ His favorite pastime is goosing humans!